Per, request, same tree I posted earlier- different angle, different camera- colors have evolved-not as expected. One week later, reds have turned to orange and yellow, greens also. Amazing transformation from the earlier colors! I never would have expected that. Still, a very pleasant scene. I like the tighter composition better than the first one. I also think the normal saturation of the colors is a benefit, compared to in-your-face saturation that many photographers cannot resist when it comes to fall color. Well done! Thanks, Jens. Yes, I like this one better too. Different camera also. When I look at my other post, I suppose it appears a bit over the top. It was originally underexposed. Perhaps I brought up the colors a bit too much. That said, the reds were really intense. It is very odd , the way this tree has changed. Colors here have been mostly yellows and browns- hardly any reds. But one would expect red to go to red! We've had hard freezes, drought and unusually high temperatures this spring , summer and fall. Very strange altogether. 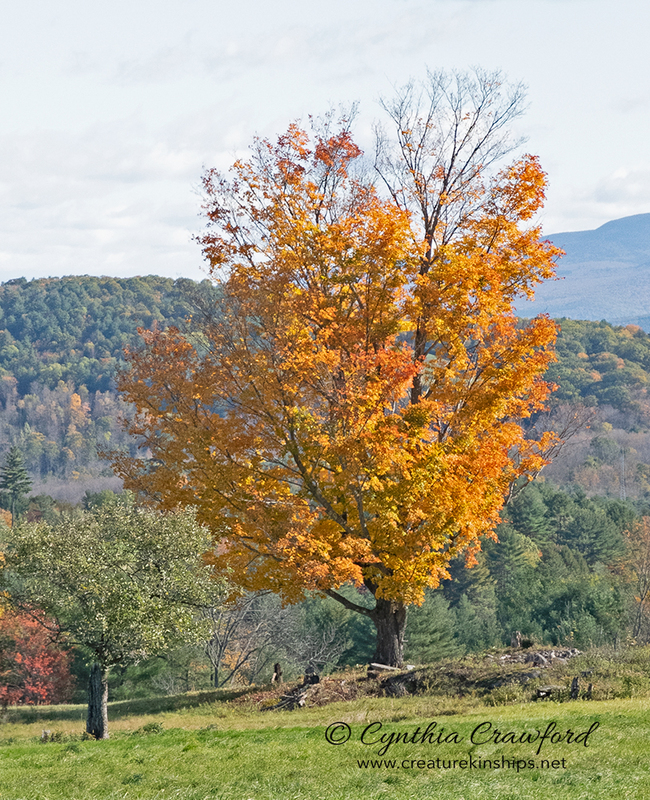 Parts of Vermont have had some beautiful (normal) color. The little creatures are still there....... but quite a few of the leaves have gone! Fascinating how the different colours have transformed already to this more uniform shade in just a week. I like both views. I really like the yellow/golden leaves and the composition. The angles of the mountains apex just at the tree so it brings my eye to it. Just a bit of wondering if a darker sky would make the tree pop a bit more? Amazing to see color changes so fast to full yellow. Very pretty. Thanks Ed. Yes, I suppose I could darken the sky if selected. Otherwise the whole thing would be too saturated, I think. It would be a nicer contrast.